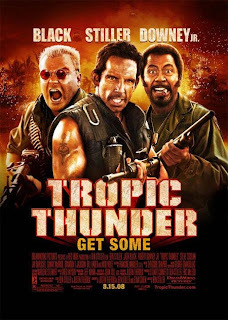 Okay, I must admit I took my time to watch Tropic Thunder (2008). It was just one of those films I really wanted to see last year, and then once it was in the 'New to Weekly' category I finally got it out. For a half action film, it was so freaking funny!!!!! You see, since I watch a lot of movies, I totally got some of the jokes in this film. I mean, Robert Downey Jr. playing an Australian who's playing a African-American in a 'war film'?! Priceless (now I see why Hugh Jackman wasn't too pleased about being 'an Australian playing an Australian in a movie called Australia'). And considering he got nominated for an Oscar for a complete nonsensical role, that is amazing. Ben Stiller, who also directed the film, stars as huge Blockbuster star Tugg Speedman, who's star is declining, mainly because of his recent flop 'Simple Jack'. If you ask me, that film looks hilarious!!! But, as Kirk Lazarus would say, 'never go full retard'. Jack Black also stars as Hollywood bad-boy Jeff Portnoy, who stars in the 'Fatties' films, where he just farts all the time. So what are all these actors doing in a comedic romp? They have been sent to Vietnam to shoot a war film, but it looks possible that the film will never be made, due to the big demands from the stars and the rookie director. So the director tries something new, to send the actors out on their own, so the movie seems more realistic. Things get messy, but what goes on is extra funny. The cast is great, Stiller, Black, Downey Jr., but also support from Matthew McConaughey (my faith is once again restored on him), Steve Coogan, Nick Nolte, and of course, Tom Cruise. Yes, that crazy actor that is splashed all across the media every week, playing a fat bald foul-mouthed hip-hop dancer producer. What a mouthful. That is the highlight of the film. Anyway, a must-see comedy!